This map shows the Aram Chaos region of Mars, where ESA's Mars Express found mineralogical evidence for large-scale deposits of ferric oxides (commonly known as 'rust' on Earth) and sulfates. 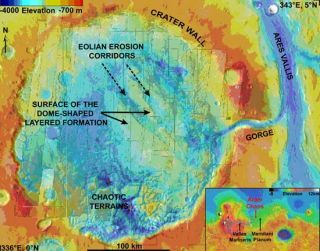 The inset indicates the location of Aram Chaos on a MOLA topographic map of Mars. TheEuropean Space Agency's Mars Express Orbiter has spied evidence of a largeconcentration of rust, revealed by erosion, on the planet's surface. The finding,detailed in a recent issue of the Journal of Geophysical Research, isyet another clue that will help scientists piece together the picture of Mars'past climate. The brightred dust covering most of the planet is known to be enriched in ferric oxides,more commonly known on Earth as rust. But Mars Expressobservations show that the dark deposits of Aram Chaos, a crater about 170miles (280 kilometers) in diameter lying almost directly on the Martianequator, have a ferric oxide signature that is four times higher than elsewhereon the surface. Ferricoxides are generally found with sulfates but, in this case, the lightersulfates have been blown away, leaving the ferric oxides exposed. "Theyhave accumulated in dark deposits at the bottom of sulfate cliffs," saidStephane Le Mouelic of the Universite de Nantes in France, and a member of theteam who performed the investigation with Express' OMEGA instrument, theVisible and Infrared Mineralogical Mapping Spectrometer. Thisconcentration suggests that the ferric oxides have been uncovered by erosion beforedropping to the base of the cliffs. The dunes in this region are also enrichedin ferric oxides. Thisphenomenon is not unique to the Aram Chaos region: NASA's Opportunityrover discovered ferric oxide deposits in Meridiani Planum, about 600 miles(1000 km away). The scientists called the deposits "blueberries,"because of their spherical shape. Valles Marineris, about 1,850 miles (3,000 km)away, also shows similar deposits. So Mars Express' detection of ferric oxidesin Aram Chaos links together widely separated areas of Mars. There mayeven be other regions that have witnessed the same accumulation process but nowlie hidden from Mars Express' view. "OMEGAis sensitive to the first hundreds of microns of the surface. So, a layer ofMartian dust just one millimeter thick will hide the signature from us,"said lead author of the study Marion Masse, also of the Universite de Nantes. Fortunately,in many regions of Mars, such as Aram Chaos, wind erosion has blown the dustcover away, leaving bulk rocks exposed. The team isnow exploring possible explanations for how the sulfates and ferric oxidesmight have accumulated in the first place. They're ruling nothing out: It couldbe anything from atmospheric precipitation such as rain or snow, to volcanicashes or glacial deposits.